Millions of people in the path of Hurricane Florence are frantically preparing for a monster storm that’s anticipated to make landfall as early as Friday afternoon. Residents in states from Virginia to Georgia — especially those who live in flood-prone areas or on the coast — must decide whether to stay or go. Marcus Hester stopped by one of the last stores open in downtown Wilmington, North Carolina, Village Market Grocery, to stock up so he could ride out the storm at his house in Wilmington. At Village Market Grocery, Hester bought “canned foods, things that don’t have to be heated,” he said. He said he felt safe even though Wilmington is in the current path of the storm. “We’re 20 to 30 feet above the river. You’re not going to get any flooding there. We’re miles from the beach,” he said. The few restaurants still open in Wilmington were drawing hungry customers preparing to spend hours inside as the storm approaches. A Waffle House was doing brisk business with a limited menu. A waitress said staff members were staying in a hotel across the street and planned to stay open as long as they could, using gas and generators for power. At the Paper Crane Asian restaurant, Sharon and Sammy Edwards ate lunch Thursday afternoon as wind picked up outside. They said they made a reverse evacuation – driving down from Rocky Point 15 miles away to stay with Sammy’s brother. They live in a low-lying area so they felt safer driving 10 miles toward the coast to stay on higher ground. Barbara Timberlake of Leland, North Carolina, walked down with her dog to look at the choppy Cape Fear River. 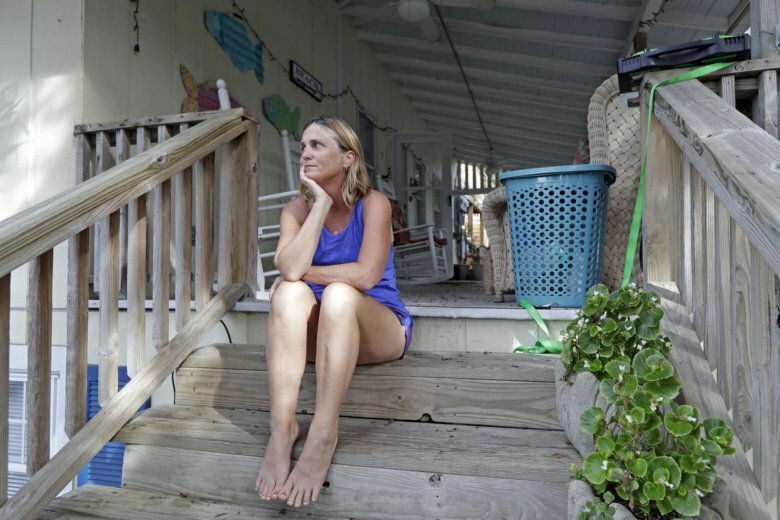 She lives about 15 miles inland from Wrightsville Beach, in the path of the storm. She said she was born in Wilmington and that her family always had a tradition of going to the beach to watch the ocean before a major storm hit. But the beaches are closed due to mandatory evacuations. “It’s a family tradition to go look at the ocean. Now they won’t let you over the bridge, so the next best thing is an angry river,” she said. She said she and her husband felt safe to ride out Hurricane Florence in their house, even though most of their neighbors have left town. She thinks they left because most are originally from the North and not used to riding out hurricanes. She said she and her husband stocked up on supplies. Julie Terrell of Wilmington decided it was safe enough to ride out the storm in her neighborhood several miles inland despite her concerns about falling trees. On Thursday, she walked past a row of shops fortified with boards, sandbags, and hurricane shutters to look at the choppy Cape Fear River that could overflow and inundate downtown shops. She ducked into a Waffle House restaurant, one of the few still open. Winds were causing traffic lights to sway and Spanish moss in trees to blow sideways. She said she worries about damage in her neighborhood from old trees. “On a scale of 1 to 10, I’m probably a 7” in terms of worry, she said. “We have a bunch of old trees in our neighborhood. Everything is old, so that’s concerning,” she said. One South Carolina family living two blocks from the ocean thought long and hard about leaving before Hurricane Florence hit, but they just couldn’t afford it. Mercedes O’Neill said she is scared to be in her North Myrtle Beach home with her boyfriend, her 6-year-old daughter and a son due Sept. 27 when the winds and rain pick up. But she says they couldn’t afford to stay in a hotel or to drive to a shelter. And she didn’t want to leave her cats behind. A family member rented a room, but when the storm slowed down, they couldn’t afford any extra days. O’Neill’s boyfriend Kelly Johnson says the couple needs to get back to work as soon as they can and returning after an evacuation can take several days. Hours before a mandatory evacuation took effect, Wrightsville Beach, North Carolina, resident Phoebe Tesh paused while loading her car to have a glass of wine on the steps of the house where she and her husband rent an apartment. “We just love it down here so much we want to spend as time as we can,” she said. Tesh, who works in information technology for UNC-Wilmington, said she and her husband have been ferrying valuables to her parents’ house on the mainland in Wilmington, where they planned to ride out the storm. She and her husband, a professor at UNC-W, love the beach so much they sold a house on the mainland to rent there full time five years ago. She said they typically evacuate for major storms, and even neighbors who tend to ride out hurricanes are leaving. “We don’t know of anyone who’s staying for the storm,” she said. Looking over a fleet of utility trucks staged near Charlotte Motor Speedway, retired utility worker Paul Anderson confessed Wednesday that he gets a rush from helping out with recovery efforts. The pay is good, but that’s not why he does it. Anderson didn’t hesitate this time, gathering people from Florida and Alabama and preparing to roll toward Wilmington, North Carolina. At least two dozen trucks were parked near the speedway as workers loaded equipment into a trailer. Skip Foreman reported from Charlotte, North Carolina, Jeffrey Collins reported from Myrtle Beach, Ben Finley from Norfolk, Jonathan Drew from Wilmington and Tamara Lush from St. Petersburg, Florida.